When I’m in a bad mood I like to be left alone. I find solitude quite therapeutic. Thankfully I can just pick myself and find a quiet spot, but when you’re a captive monkey the options are limited. Keepers at Colchester Zoo have found that a mandrill, named Milly, has learnt to place her hand over her eyes whenever she wants to be by herself. And it seems her behaviour has been copied and learnt by other monkeys in her troop. 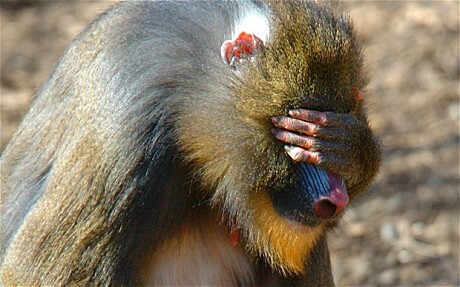 Sarah Forsyth, the zoo’s curator, said: “It really does show you how intelligent mandrills are. They really are extraordinary monkeys. We believe that Milly made up the signal and during the past five years some of the younger mandrills have picked it up. Mandrills are the most colourful mammals in the world. The skin colours brighten as the monkey gets more excited. Males have an orange/yellow beard and an unmistakable bright red and blue snout and rump. Females and juveniles have a duller blue snout and a buff-coloured beard. Experts believe this hand signal is evidence of social culture among animals. No other monkeys use the gesture, says Mark E. Laidre, an evolutionary biologist at the University of California, Berkeley in America. He’s been observing mandrills in Africa, Europe and North America for more than five years. The gesture is not to block the sun, and their eyes remain open. Scientists have known incidents when monkeys have used sign language for genetic or environmental reasons but this is the first example of its kind with cultural roots.